During the first week of December each year, The Festival of Trees brings the joy of the holiday season to the families of Southwestern Washington with a wonderful display of beautifully decorated Christmas trees. The annual event benefits the many children and families at Mary Bridge Children's Hospital and Health Center in Tacoma, Washington, and is organized by a dedicated group of community volunteers, the Tacoma Orthopedic Association and Mary Bridge Children's Foundation. Each tree is uniquely themed and trimmed with holiday decor And special gifts, all donated by the tree's sponsor, and auctioned during the gala event. 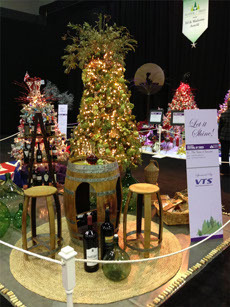 This year, VTS, Inc. participated as a Platinum level sponsor of the event, as well as sponsoring an Italian themed tree that featured gifts from the region of Tuscany, including authentic decor, a cooking class, and wine tasting.